Cook the pasta in salted water according to package instructions. Drain and rinse in cold water. Let pasta “dry” slightly and toss in a bowl with pesto. Add Parmesan cheese, tomatoes, black olives and Mozzarella cheese cubes. Toss well to combine and refrigerate. 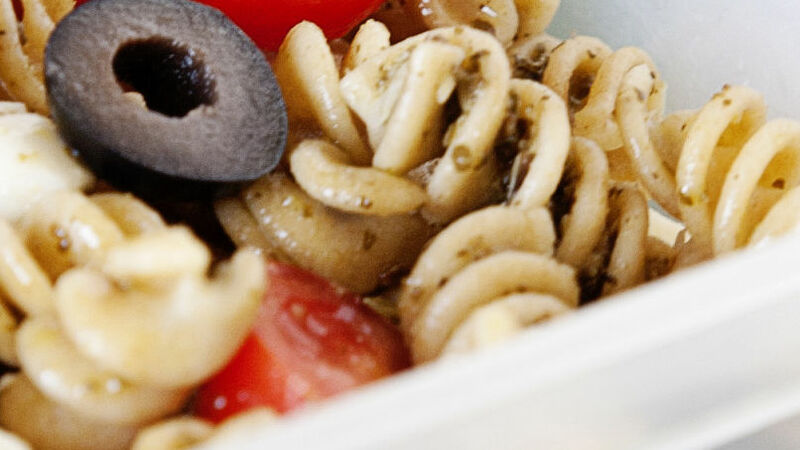 Boil pasta while cooking dinner to save time and prep this salad the night before. In the morning, give it a toss and pack in lunch container. Involve your kids in making this lunch and they will discover that “green” foods can be delicious! All the favorite flavors from their beloved pizza are creatively mixed in this one-bowl dish!